(AvGeekery.com) -- NASA's newest discovery mission to Mars will launch this spring to begin the first extensive exploration of the planet's internal structure. 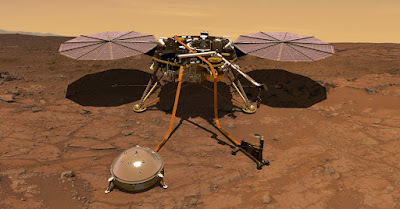 The Interior Exploration using Seismic Investigations, Geodesy and Heat Transport (InSight) is scheduled to lift-off for the Red Planet and into a predawn sky on May 5 from Vandenberg Air Force Base, California, and land six months later upon the Martian plains of Elysium Planitia. Launch officials will have only 35 days to launch the spacecraft during a period in which the Earth and Mars are perfrctly aligned. This mission will mark the first interplanetary mission to launch from the West Coast. NASA hopes the spacecraft will provide new insight into several key questions such as does Mars have a liquid or solid core, and learn about the planet's internal motions including the Sun's effect on the fourth planet from our closest star. CAPE CANAVERAL, Fla. -- An American Marine Top Gun test pilot, a Russian biochemist, and an Italian Special Forces parachutist lifted off on Friday a top a Russian Soyuz rocket beginning a voyage to rendezvous and dock with International Space Station. Nearly six hours later, the crew of three successfully docked to the Russian Rasvet module on the Earth facing side of the space station at 5:54 p.m. EDT -- seven minutes earlier than planned. NASA astronaut Randy J. Bresnik, Russian Soyuz commander Sergey Ryazanskiy, and Europe's Paolo Nespoli, all three space veterans, will be busy with a multitude of science experiments; the arrival and undocking of several unmanned cargo crafts; and spacewalking as they prepare the orbital outpost for new hardware. Launched from the historic launch site at Baikonur Cosmodrome in Kazakhstan at 11:41 a.m. EDT (9:41 p.m. local), today's lift-off occurred from the same pad Russia's Sputnik 1 launched from sixty years ago this October. That successful satellite launch in 1957 heralded the dawn of the space age. As the Soyuz soared skyward into the darkening skies of sunset, a 400-foot golden flame pushed the rocket higher as it traveled eastward. Nearly nine minutes later, a strong jolt was felt by the crew as their Soyuz spacecraft separated from the rocket's third stage upon reaching orbit 125 miles above. CAPE CANAVERAL, Fla. -- Astronauts aboard the International Space Station may have the best windows for viewing the Great American Eclipse as they photograph and record August's astronomical event during three consecutive orbits. Soaring 255 miles above, the six person crew of Expedition 52 will have detailed observation objectives in place as they point cameras from the Cupola's windows while they trek across North America once every 91 minutes. They will also be the first humans to witness this solar eclipse thanks to orbital mechanics. In May 2012, NASA astronaut Don Pettit witnessed a solar eclipse from Earth orbit. "It is amazing to see an eclipse from orbit," Pettit recalled. "The shadow on Earth looks just like what you see in the physics and astronomy books." Newly released ground tracks by NASA provided to AvGeekery.com show the space station's three positions as it passes through the Moon's penumbra during the midday hours of August 21 -- the height of solar eclipse across America. Astronauts will attach special solar filters to their 400 mm and 800 mm cameras as they approach their first observation's over the Pacific Ocean. CAPE CANAVERAL, Fla. -- A uncrewed SpaceX cargo craft departed America's Space Coast on Saturday loaded with nearly three tons of supplies for astronauts living and working aboard the International Space Station. The SpaceX launch marked the first reflight of a Dragon spacecraft, and also set a historic milestone from America's Spaceport. A Space Exploration Technologies Corp. Falcon 9 rocket lifted off from the Kennedy Space Center's Pad-39A on June 3 at 5:07:38 p.m. EDT, blazing a trail out over the Atlantic Ocean. The lift-off marked the 100th rocket launch from the historic launch complex 39-A. The launch pad was first used fifty years ago this November as the first Saturn V moon rocket launched during the uncrewed Apollo 4 mission. Pad 39-A later supported many notable space flights including Apollo 11's mission to first land man on the moon in 1969; America's first space station Skylab in 1973; the first space shuttle flight in 1981 and 81 subsequent shuttle flights; and today, SpaceX launches. Signed in April 2014 by CEO Elon Musk, SpaceX has an exclusive twenty-year lease with NASA to use 39A for both uncrewed launches, and future crewed missions aimed at sending astronauts to the space station and Mars. A Dragon 2 spacecraft will be used for crewed flights to the station beginning in summer of 2018. CAPE CANAVERAL, Fla. -- A high-speed broadband spacecraft designed to increase advanced data services to remote maritime and aviation locations lifted off on Monday from America's Space Coast. Inmarsat 5 F4 Global Xpress satellite will expand high-speed broadband connectivity across the planet with Ka-Band service. The $240 million spacecraft will soon join a fleet of three fifth-generation telecommunications satellites in geo-stationary orbit. Built by Boeing in El Segundo, California, the global communications spacecraft has twin solar arrays for a combined 42 meters -- longer than that of a Boeing 737 aircraft. Inmarsat is scheduled to operate on orbit for approximately 15 years. 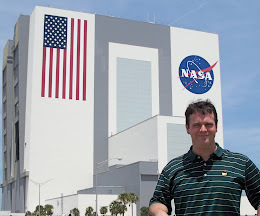 "It's been a great afternoon and evening out at Kennedy Space Center," stated John Insprucker, SpaceX principal integration engineer, minutes following the craft release into space. "We counted down with excellent weather; launched right on time -- the first stage did great, the second stage went through two burns just as planned. Now, we've topped it off with the separation of Inmarsat 5 F4 for our Inmarsat customer." A flawless countdown lead the Space Exploration Technologies Corp. (SpaceX) Falcon 9 to ignite it's nine Merlin engines on time, launching from the Kennedy Space Center's historic pad 39-A at 7:21 p.m. EDT. The white candlestick soared straight up and into the light blue clear skies before it began to veer toward the eastern horizon. HUNTSVILLE, Ala. -- The annual Geminid meteor shower will dazzle stargazers across the United States this week with the peek of the biggest celestial light show featuring nearly 100 shooting stars per hour. A comet known as 3200 Phaethon will swing across Earth's orbit, it's tail made up of space rocks creating a multitude of meteors across the midnight sky. Once thought to be an asteroid due to its lack of an icy shell, astronomers have learned Phaethon's ice melted due to its several close trips around our Sun. 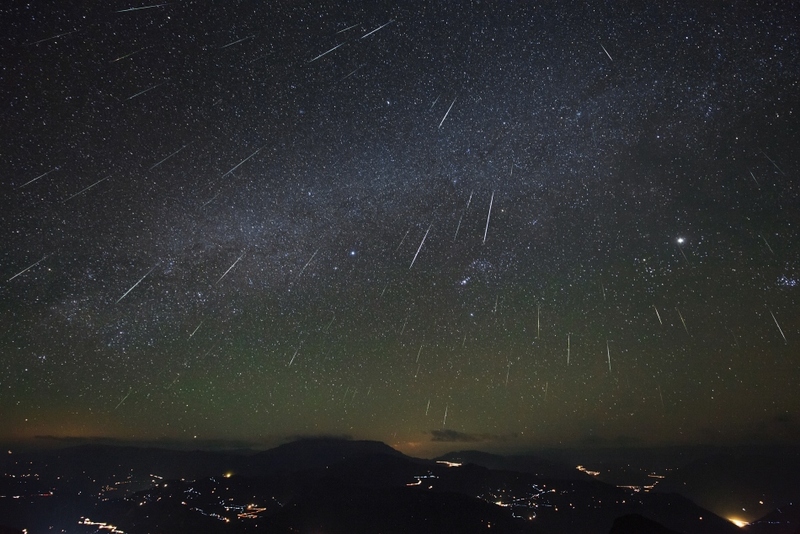 "The Geminids is usually one of the best meteor showers of the year," said Chief Astronomer David Dundee of the Tellus Science Museum near Atlanta on Monday. "They are usually bright meteors, and the Moon will not interfere this year either." Observers will forgo the need of a telescope instead placing a blanket or lawn chair in an open area empty of any light pollution. Dundee noted that the celestial event may reach up to of 100 meteors per hour as observers look to the east from around midnight to dawn on Wednesday. "It usually produces at least 50 meteors per hour, last year we had over 120 per hour," Dundee added. "Fortunately, the Moon will be a waxing crescent during this event; thus, it will set early so its light will not interfere with observations of fainter meteors." A network of ground cameras sponsored by NASA's Meteoroid Environment Office have been busy capturing the Geminids during December providing astronomers key images of the streaking fireballs. The black and white images can detail a meteor's direction of travel, and give astronomers a better count of just how many hit our atmosphere per hour. Six of the fifteen cameras are located in the southeast, including one a top Tellus; four in the Ohio-Pennsylvania region, and five in New Mexico and Arizona. 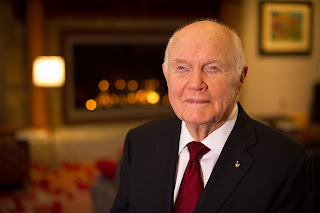 CAPE CANAVERAL, Fla. -- Col. John H. Glenn, the first American to orbit the earth and long time senator from Ohio, died on Thursday at the James Cancer Hospital in Columbus, Ohio. He was 95. On February 20, 1962, John Herschel Glenn, Jr. became a national treasure as he lifted-off inside his cramped Mercury spacecraft known as Friendship 7 to begin America's first three orbits of manned spaceflight. “The Ohio State University community deeply mourns the loss of John Glenn, Ohio’s consummate public servant and a true American hero," said Ohio State University President Michael V. Drake. "He leaves an undiminished legacy as one of the great people of our time." A Marine fighter pilot during World War II, Glenn began his aviation career in 1943 and flew nearly sixty combat flights over the southern Pacific waters. He also served during the Korean War piloting ninety combat flights in both a F9F Panther and a F-86 Sabre jet. Later at age 77, Glenn became the oldest person to fly in space as "six astronauts and one American legend" launched aboard space shuttle Discovery in October 1998. The senior astronaut had remained active in promoting America's space future through 2016, including speaking out on the "premature" cancellation of the shuttle program. Born in Cambridge, Ohio on July 18, 1921, Glenn later attended Muskingum College earning a Bachelor of Science degree. He is survived by his childhood sweetheart, Anna M. (nee Castor). The couple were married for seventy-three years, resulting in two children and two grandchildren. CAPE CANAVERAL, Fla. -- A military satellite for the U.S. Navy designed to increase mobile communications for the military world wide was successfully placed into Earth orbit on Friday following its launch from America's Space Coast. The fifth Mobile User Objective System (MUOS) spacecraft will serve as a spare and complete the high quality mobile communications constellation used by troops on the move around the globe. Acting as a massive cell tower in space, the military is using MUOS to connect with isolated troops unavailable by other other transmittable means. "MUOS 5 is identical to (past) MUOS, and keeping a spare is all part in ensuring that the MUOS capabilty we are delivering will be around for the next 10-plus years," said Commander Peter Sheehy of U.S. Navy Communications Satellite Program Office minutes following the launch. "Launches like what we experienced today require month and months of preparation and that's something we don't want to wait for, and that's why we keep an on-orbit spare." Lift-off of MUOS 5 occurred on time at 10:30 a.m. EDT, on June 24, from Cape Canaveral Air Force Station. As the countdown reached zero, the launch pad's ground umbilical and hold down posts broke free allowing the powerful United Launch Alliance Atlas 5 rocket to carry the spacecraft toward orbit. Powered by five solid fuel boosters and a liquid fuel main engine, the Atlas 5 thundered into the blue skies and eastward out over the Atlantic waters. Nearly two minutes later, the nearly 200-foot rocket dropped its spent boosters while its RD-180 core engine continued to burn. 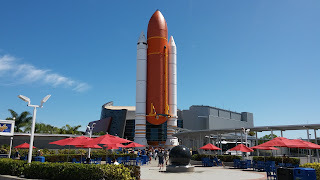 Exploring space with new simulators and witnessing the thundering launch of a rocket are a few of this summer's highlights designed to educate and excite the public as NASA prepares for interplanetary travel, the Kennedy Space Center's Visitor Complex announced on Sunday. 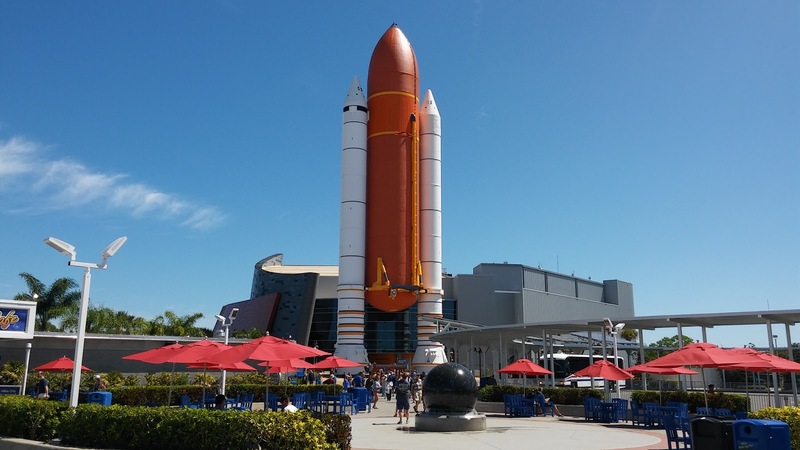 Summer plans are in full swing as families look toward America's Space Coast for the excitement of the beaches, and the educational interest of the Kennedy Space Center. The next generation of space explorers are leaving their princess dresses and superhero outfits behind for flight suits and NASA caps to get an up close presence with the strong core STEM (Science, Technology, engineering and Math) values taught in school. The warm space coast weather will give visitors chills of excitement as no less than eight major rocket launches are planned between June 1 and Labor Day weekend. The first rocket poised to lift-off is the massive Delta IV-Heavy on June 4 with a military payload on board. Space center visitors will be updated on launch times and given suggested locations to view each flight. CAPE CANAVERAL, Fla. -- A first of its kind expandable space habitat module and several tons of science equipment are poised to lift-off a top a SpaceX Falcon rocket on April 8 on a two-day voyage to resupply the International Space Station, NASA confirmed during a news conference on Monday. NASA officials said the Space Exploration Technologies Corp. (SpaceX) has set next Friday for the launch of its Falcon 9 at 4:43 p.m. EDT, from Cape Canaveral Air Force Station. The commercial company's Dragon supply ship will arrive on orbit nearly ten minutes later, deploy its solar arrays, and perform a series of thruster burns as the spacecraft chases down its port-of-call. "This is a launch that we've been waiting for quite sometime because it's really important to our overall ISS Research Program," chief scientist for the International Space Station Program Dr. Julie Robinson on Monday. "It has about 2000 kg of research equipment and supplies. The big driver on that amount of mass is that we have about 1400 kg of the BEAM module which will be tested on ISS -- that's the heavy one." This 23rd flight of a Falcon 9 will mark the company's eighth operational Dragon launch under NASA’s Commercial Resupply Services contract. The launch will also mark the first flight of a Dragon supply craft since the June 2015 explosion of a Falcon 9 which destroyed its Dragon off America's Space Coast. Two days following launch, Dragon will be grappled by the station's 57-foot robotic arm at about 7:00 a.m., and slowly maneuvered over to its docking port on the space facing side of the Tranquility module. Dragon will then dock to the orbital outpost three hours later. CAPE CANAVERAL, Fla. -- A NASA astronaut destined to become the U.S. record holder for time spent in space and two cosmonauts lifted off from Kazakhstan on Saturday and successfully arrived at their new home aboard the International Space Station. American Jeff Williams and Russians Oleg Skripochka and Alexey Ovchinin rode the golden flame of a Soyuz rocket into the black skies above the Baikonur Cosmodrome to begin a nearly six hour voyage on the ocean of space to the orbiting laboratory. Launch occurred on time at 5:26:38 p.m. EDT, on Friday (3:26 a.m. local on March 19) as the space station soared 252 miles above Kazakhstan. As the rocket climbed toward orbit, its spent core booster separated to allow the second stage to carry the crew higher. "Everything's fine on board. We're feeling fine," the crew radioed mission control in Moscow midway through the dynamic launch. Ten minutes after lift-off the Soyuz was alone in its planned orbit, its solar arrays and antenna deployed. The crew then began it's four orbit trip to the station. After a series of course correction burns to chase down the football field-size complex, the Russian Soyuz TMA-20M docked automatically to the outpost without issue at 11:09:55 p.m. The last Soyuz-crew docking attempt three months ago was hampered by a failed docking radar which forced the craft's pilot to switch to manual and dock ten minutes late. That space crew of American Tim Kopra, Briton Tim Peake and Russian Yuri Malenchenko will join the newly arrived crew. Together, the crew of six will prepare for a busy next few weeks of science experiments, and the arrival of two resupply crafts. This mission will mark a record third long duration flight by an astronaut as Williams prepares to set another long duration record by an American. "Williams will become the new American record holder for cumulative days in space at 534 surpassing commander Scott Kelly, who wrapped up his one-year mission on March 1," NASA spokesperson Mark Garcia said on Friday. Garcia added that Williams will become the new space station commander on June 4. NASA astronaut Scott Kelly reflected on his past year living aboard the International Space Station on Thursday as he and Russian cosmonaut Mikhail Kornienko prepare to wrap up their historic space flight next week. Kelly and Kornienko are packing up their Soyuz TMA-18 spacecraft for their journey back to Earth on Tuesday (EST), and preparing their bodies and their minds for the adjustment back to gravity. No American before has spent one year in space, and Kelly's mission will offer NASA the answers for how humans will survive during a long duration mission to Mars. During a final news conference from inside the orbiting laboratory 255 miles above, Kelly provided inside details of his experiences and insight into his health. Kelly, who will handover his command of the space station to American Tim Kopra on Monday, said on Thursday that flying in space is a privilege in a harsh environment. "The space station here is a magical place it's a incredible science facility we have... I have been here nearly a year and you don't feel perfectly normal (here)," Kelly began as he spoke inside the Destiny Laboratory module. "It's not exactly uncomfortable but it's a harsh environment, for instance having no running water and then the fact that everything floats makes your daily life just difficult." With that said, the Orange, N.J. native stated that "I could go another 100 days. I could go another year if he had to -- if it made sense -- however I look forward to getting home next week," Kelly said. He adds that he feels his flight is "another of many stepping stones to us landing on Mars sometime in our future." An international space observatory designed to perform astronomical observations of the universe using several advanced X-ray telescopes is poised to lift-off on Wednesday from its seaside launch site near southern Japan. The ASTRO-H observatory will investigate the make up of the universe, including long standing questions, 'how do black holes develop and how are galaxy clusters created?'. The spacecraft will will look deep into space to learn the evolution and structure of the universe. Designed and built by an international collaboration led by the Japan Aerospace Exploration Agency, or JAXA, over 70 institutions contributed to the ASTRO-H observatory in the U.S., Canada and Europe. NASA's Goddard Space Flight Center and the European Space Agency will collaborate by using a few of the four ASTRO-H x-ray instruments. "ASTRO-H is capable of observing X-ray sources, like galaxy clusters and neutron stars, more than 10 times fainter than its predecessor, Suzaku, which operated (until) 2015," NASA spokesperson Francis Reddy said. "To achieve this, ASTRO-H uses four co-aligned focusing X-ray telescopes and a suite of cutting-edge instruments that provide simultaneous coverage across the observatory's entire energy range." The X-ray images from ASTRO-H are expected to be more dynamic than the visible light photographs from past space based observatories. JAXA scientists have confirmed that one X-ray photon has between 10,000 to 100,000 times the energy of optical photons. "We see X-rays from sources throughout the universe, wherever the particles in matter reach sufficiently high energies," Goddard's X-ray Astrophysics Laboratory chief and ASTRO-H project scientist Robert Petre said. "These energies arise in a variety of settings including stellar explosions, extreme magnetic fields or strong gravity; and X-rays let us probe aspects of these phenomena that are inaccessible by instruments observing at other wavelengths." CAPE CANAVERAL, Fla. -- NASA's Curiosity rover recorded a self portrait recently as it paused from scooping sand samples near an active dune on the Red Planet for an astronomical selfie, the space agency announced on Friday. The Mars Hand Lens Imager was extended from the end of Curiosity's robotic arm and collected 57 photographs on January 19 as the rover sat poised on Namib Dune. Project engineers at the Jet Propulsion Laboratory in Pasadena then arranged the images to form an impressive true image of the rover. The selfie mosaic was taken on Sol 1228, Curiosity's 1228 day on Mars, highlights the first complete photograph of the car size rover since it arrived in 2012. Mission scientists paused during the scoop series for an impromptu series of images. "The mission's current work is the first close-up study of active sand dunes anywhere other than Earth," NASA JPL spokesperson Guy Webster explained. "Investigation of the dunes is providing information about how wind moves and sorts sand particles in conditions with much less atmosphere and less gravity than on Earth." January's scoop samples are the first taken by the Martian science laboratory since November 2012 as NASA aims to study the different size sand grains. The scooped samples were feed into a sieve which allowed only particles the size of .0006 of an inch to move into an inlet for further examination. "It was pretty challenging to drive into the sloping sand and then turn on the sand into the position that was the best to study the dunes," said JPL's Curiosity mission planner Michael McHenry on Friday. McHenry added the rover's wheel was first checked the area before making its first scoop on Jan. 14, "The scuff helped give us confidence we have enough sand where we're scooping that the path of the scoop won't hit the ground under the sand."